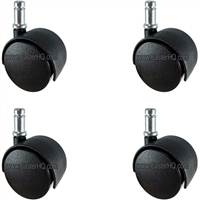 Replacement Chair Casters for Dinette Chairs, Displays, and Furniture. This page is for our 2-3/8" or 60mm Dinette Chair Casters with a 7/16" x 7/8" Grip Ring Stem also known as a Friction Ring Stem. Shop Dinette Chair Casters from CasterHQ. 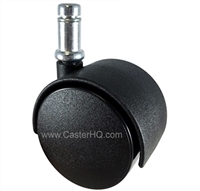 CasterHQ offers Replacement Chair Casters for Dinette Chairs, Displays, and Furniture. This page is for our 2-3/8" or 60mm Dinette Chair Casters with a 7/16" x 7/8" Grip Ring Stem also known as a Friction Ring Stem. Our 2-3/8" Dinette Chair Casters are known as Twin Wheel Nylon Casters and are great for most floor types including hardwood floors, tile, and carpet. If you have expensive hardwood floors we would recommend upgrading to a Gray Thermo Plastic Rubber wheel which provides a softer cushion ride to avoid scuffing or imprinting on the floors. Our standard 60mm Dinette Chair Casters are constructed out of a strong nylon composite and can withstand up to 120 lbs per caster meaning a Dinette chair with 4 casters would be able to support 480 lbs using our Dinette chair wheels. 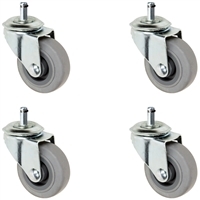 The nylon composite twin wheel casters are non-marking and will not leave streaks on your floor.